Pulsar LGM-1 is a dual channel modulation powerhouse for the Reason rack. We call it an LFO—but it’s also a powerful little synth in its own right. For tweakers, Pulsar makes every single thing in the rack a little bit better. For back-of-the-rackophobes it comes with patches containing everything from lush evolving pads to the grittiest of wobble basses. Need to add slow modulation to a filter, or alter the speed of a tremolo as you trigger new notes? Pulsar is up for any task. Turn up the Shuffle parameter to introduce some irregularity to your modulation. Smooth out sharp waveforms using Lag. Or go all-out bonkers and let LFO2 trigger the built-in envelope, set to change the rate of LFO2, and route the combined outputs of both LFOs to control the rate of LFO1. 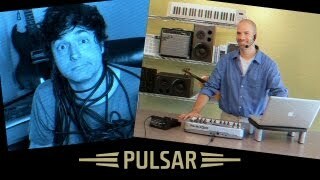 When the rate is turned up, Pulsar transforms from low frequency oscillator to high powered synth with plenty of character. The LFO waveforms in combination with lag and shuffle brings tons of tones—edgy and noisy.